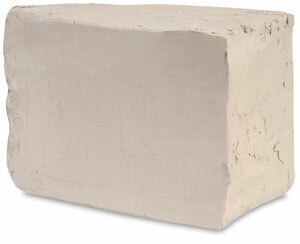 Blick's low-fire, de-aired, talc-free moist clay is gray-white in its raw state and white when fired. Suitable for hand-building, modeling, and throwing, it's unusually craze-resistant, with a plasticity that makes even large pieces easier to throw. Bisque fire to Cone 04 (1971°F, 1077°C). The recommended glaze firing is Cone 05 (1911°F), but this clay can be fired as high as Cone 3 (2138°F) without distortion.